This week, Raf Simons showed the third and final part in what the designer has referred to as his Calvin Klein “trilogy”, marking one year since his inaugural presentation for the American fashion behemoth. In these 12 months, Simons has picked apart his newly adopted home country, the United States, exploring the complex and divided nation through a distillation of its iconography from Hollywood to Andy Warhol’s Factory. His A/W18 offering was no exception – in what the designer deemed a move from horror to hope, it was his most densely layered offering yet. Here, AnOther explores ten of the references present in the thought-provoking show. 50,000 gallons of popcorn littered the floor of the show space, held in New York’s American Stock Exchange building. 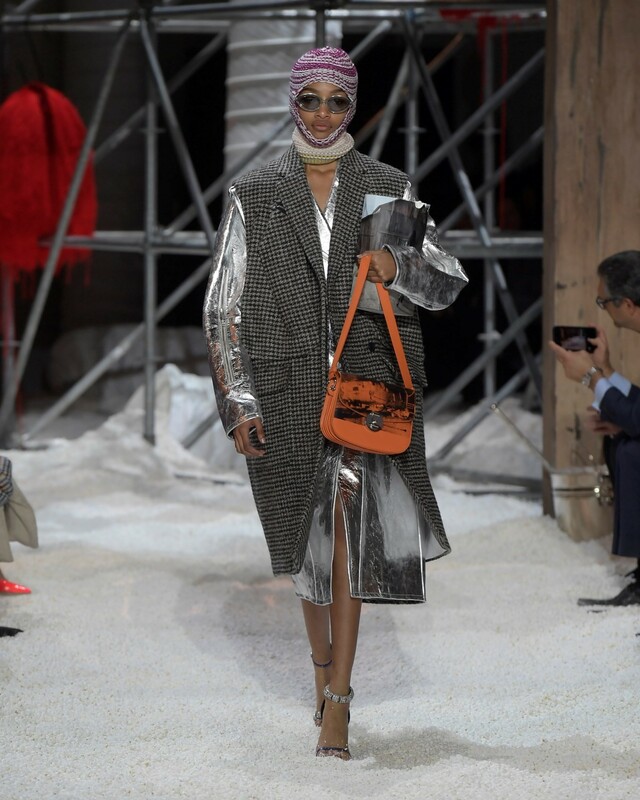 Aesthetically, the popped kernels made for quite a spectacle; it accumulated like snow drifts, with sturdy boots – including white patent waders worn by Kaia Gerber – ploughing the edible runway, forming dust particles that infiltrated attendee’s nostrils. Conceptually, the low-calorie snack referenced Hollywood, but a singed wooden barn erected in the space also evoked the corn fields of the country’s midwest. Once America, the largest global producer of both corn and cinema, comes to a fiery, apocalyptic end, perhaps this will be the result. In lieu of a press release, Simons offered 50 words, the same number as that of states in his newly adopted country. With little in the way of explanation, those words ranged from the descriptive – patchwork, collage, denim – to the conceptual – epic, fantasy, context, safe. Viewers were left to draw their own conclusions. That said, Simons did posit one word (the 51st, and not on the list) as the nexus of the collection, “freedom” – “a word that defines America, and Calvin Klein,” he said. “I wanted the show to be about heroes. All kinds of heroes,” Simons reported backstage. Central, though, was the firefighter – the most perennial of all-American heroes, untarred with the often negative connotations of their fellow men and women in uniform, the US police force and armed services. 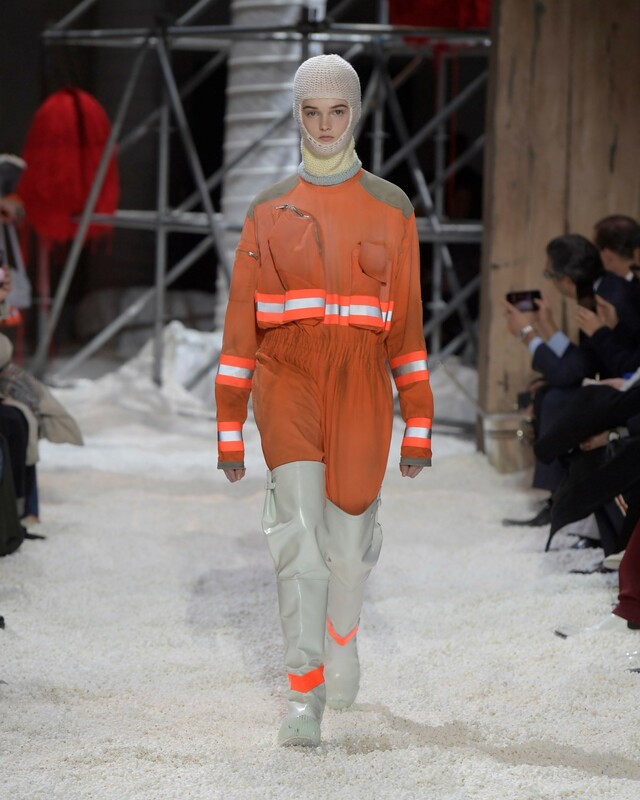 Here, Simons portrayed a newfound patriotism for his adopted home with orange hi-vis jackets and Hazmat-style rubber boots, evocative of a firefighter’s uniform. Out of the strange milieu they emerged, like the last men and women standing after nuclear fallout – their heavy gloves looking ready for clear up. 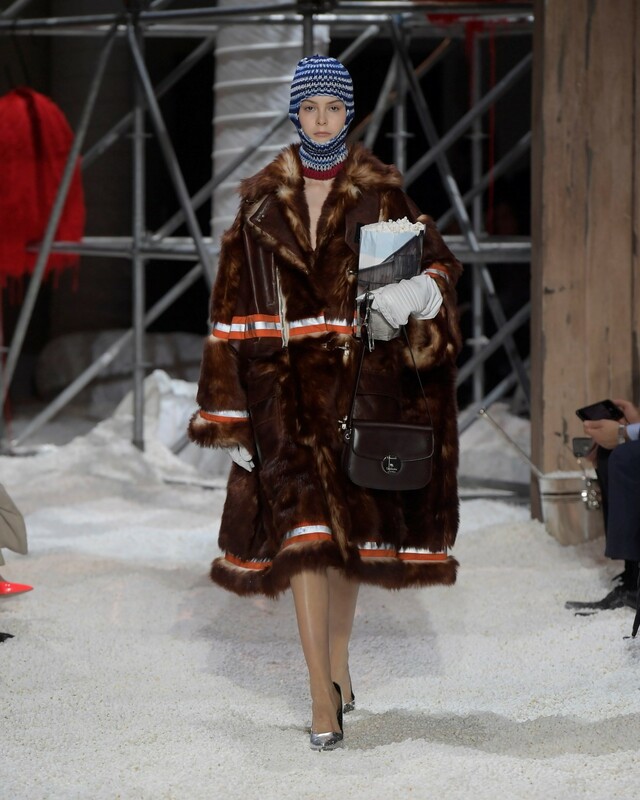 The 1995 film Safe, directed by auteur Todd Haynes, proved to be hugely influential to the latest Calvin Klein collection. The knitted balaclavas are reminiscent of the ensemble that titular character Carol (Julianne Moore), ends up sporting to “protect” herself from a siege of perceived environmental illnesses. Indeed, the medical terminology for Carol’s plight is Multiple Chemical Sensitivity – or 20th Century Disease as it is alternatively known – which stems from a psychosomatic reaction to modern and synthetic substances. Including pesticides, plastics, synthetic fabrics, smoke, petroleum, and paint fumes, excesses of the American capitalist machine become imagined irritants – this paranoia was also mirrored in Simons’ “survival blanket” dresses and hefty protective gloves. 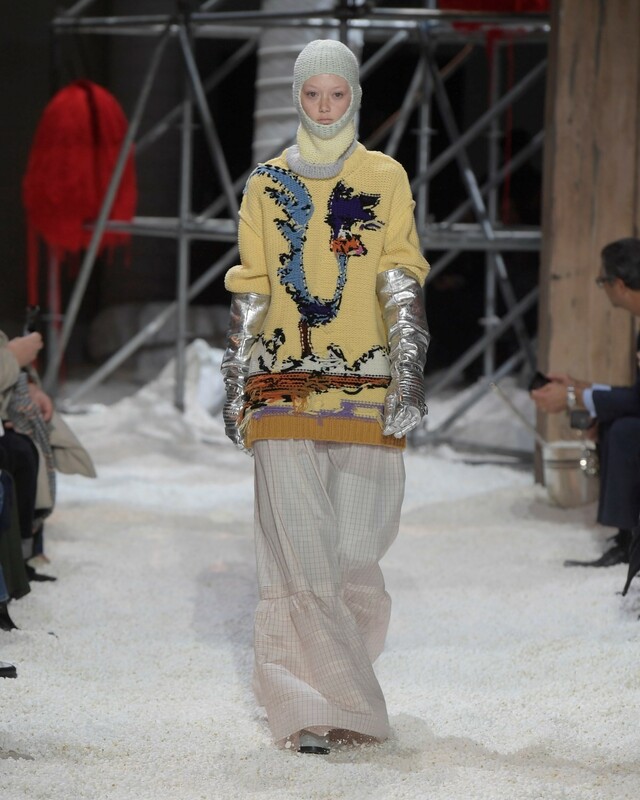 While the collection was mostly devoid of printed imagery, Simons incorporated pictorial elements into knitwear. This took the form of two oversized sweaters, seemingly turned inside-out, with Looney Tunes double act Wile E. Coyote and Road Runner abstractly emblazoned on the front of each. Superficially, it was a step away from last season’s blood-soaked horror fest. Upon scratching the surface, similarities are revealed: not only was the character Wile E. Coyote based on Mark Twain’s less than favourable description of the animal in Roughing It – “a long, slim, sick and sorry-looking skeleton... A living, breathing allegory of Want. He is always hungry” – but Looney Tunes is renowned for its slapstick and blasé depiction of gun violence and suicide. 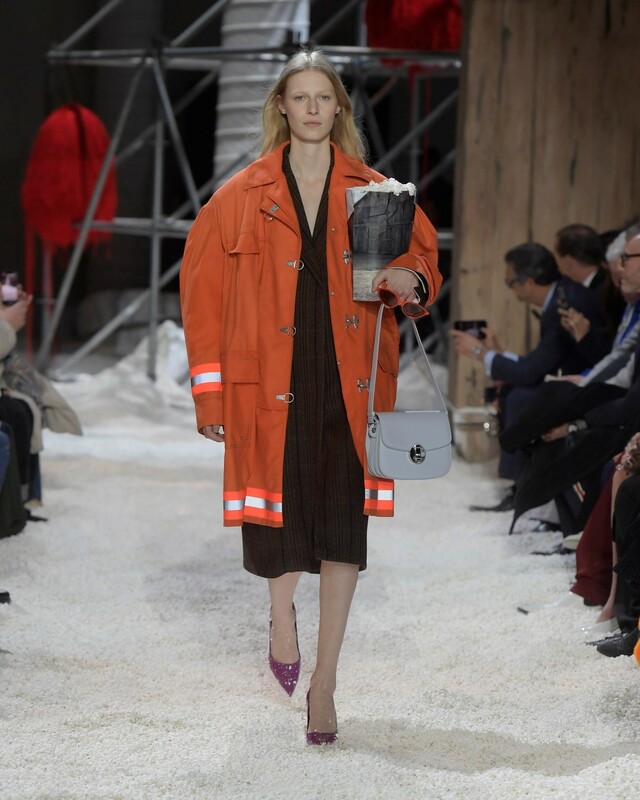 Fashion-philes will remember the last time that Simons sent a paper bag down the runway was at his A/W12 menswear show for Jil Sander, a folded over sandwich bag which would go on to retail for £185. Last night, the paper bags were filled with popcorn and carried, one-handed, down the runway, making the case for the most coveted accessory of the season being one you can pick up at your local cinema. One difference though: in a meta moment, these ones were printed with Calvin Klein’s S/S18 campaign, shot by Willy Vanderperre. More on that campaign, and its unlikely star – a barn, reminiscent of that in America’s most famous painting, Grant Wood’s American Gothic. Previously inhabited by the Kardashian/Jenner clan, Solange, A$AP Rocky, the Gerber siblings et al for Calvin’s #MYCALVINS campaign, the S/S18 campaign (also shot by Vanderperre) saw the original Calvin gang of Simons’ favourite model muses turn off the freeway of the A/W17 campaign and into heartlands of rural America. That barn made an (almost) life-size appearance in the show space – its burnt, bloodied exterior, with Andy Warhol’s The Electric Chair transposed on to it, seemed to mark a looming counterpoint to Simons’ insistence that this collection was all about hope. Another moment of self-reference – in the #MYCALVINS underwear campaign, the Kardashians starred as a representation of “the modern American family”, with the female siblings entangled in a red and white Calvin Klein patchwork blanket (the latter had been carried as accessories in the S/S18 show). The history of quilting stems back to 1800s, where quilting circles and quilting bees were a common social pastime for women in the US. In this campaign, the Instagram age collided with this era, a theme that continued in the A/W18 show, with Simons noting that it was “a meeting of old and new worlds”. The quilt remained a symbol of matriarchal community – both on- and offline – printed on chiffon gowns in rainbow hues. It’s “a different dream,” Simons said of the collection. This was evoked in the show’s soundtrack, featuring extracts of California Dreamin’ by The Mamas and the Papas. Its lyrics tell the story of an individual who is longing for the warmth of Los Angeles during a cold winter on the East Coast. When the song was released, it was seen as a timely metaphor for the mass pilgrimages westward during the 1960s summer of love. In the Calvin Klein A/W18 show, it could also been interpreted as a beacon of hope for the oppressed during these turbulent political times. One of the 50 words on the list was “Beguiled”, revealed by Simons as reference to the 2017 film Beguiled, directed by Sofia Coppola and based on the book of the same name. The film, set in the American south during America’s Civil War, sees a Union soldier taken in for safety in a girls school, even as many of the students and staff want to hand him over as a prisoner of war to the Confederate army. It is a film about the deception of safety where hidden threats abound – the overwhelming sense of paranoia tying in to the collection’s other filmic reference, Safe. More simply, there was reference to the clothes of the movie – delicate, gossamer 19th-century-style gowns were printed with plaid, frilled at the yokes to evoke the period’s heady obsession with romance. The film’s star, Nicole Kidman, watched on from the front row.